A high-speed Las Vegas police chase ended in a shootout, with officers firing a hail of bullets and hitting a suspected car thief 19 times. The suspect’s female companion was also struck, but it is unclear who shot her. On July 24, officers Tyler Hebb, 55, and Brandon Foster, 22, were monitoring a stolen vehicle they suspected was involved in a non-fatal shooting the previous day when a man matching the shooter's description entered the vehicle with a female companion. The officers requested backup from the Las Vegas police aerial unit and attempted to stop the vehicle to interview the suspect. 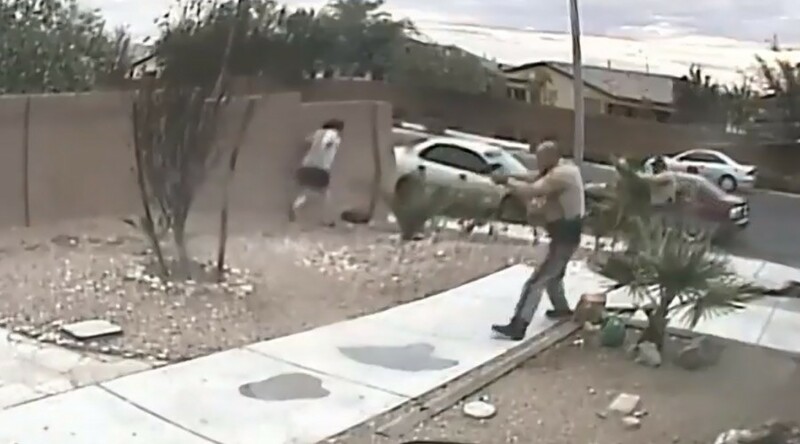 The man, later identified as William Alfredo Chafoya, 37, refused to comply and fled the scene, leading officers on a car chase before abandoning his vehicle in a North Vegas residential neighborhood. Chafoya then fled on foot, reportedly firing once in the air before aiming his weapon at the pursuing officers and firing once again. The police responded with a hail of gunfire, firing 26 rounds and striking the suspect 19 times. His female companion, Ashley Elizabeth Olivetti, 31, was also struck in the wrist, but police have yet to determine whether the round that hit her was from their weapons or the suspect’s pistol. Both were immediately taken into custody and transferred to the Las Vegas University Medical Center's trauma unit. Neither officer sustained any injuries. Las Vegas Metropolitan police released a short video statement from Captain Kelly McMahill, who works in the internal oversight division. On Thursday, Assistant Sheriff Todd Fasulo held a detailed press conference discussing the incident in which he also showed bodycam footage of the incident. Fasulo said the officers' decision to use lethal force was out of concern for bystanders on the street, who could have been caught by one of Chafoya's bullets. It is the 13th officer involved shooting in 2017 for the Las Vegas Metropolitan Police Department. Officer Foster was in his fifth week of field training, reports the Las Vegas Review-Journal. Both officers have been placed on administrative leave pending a full investigation into the incident, which is standard operating procedure for all police involved shootings. Chafoya, who fired five shots, and his female associate now face multiple felony charges. Both are in stable condition in the hospital and are recovering from their injuries sustained during the firefight.